Ideal for general cultivating, weeding, pasture renovating and preparing seedbeds. 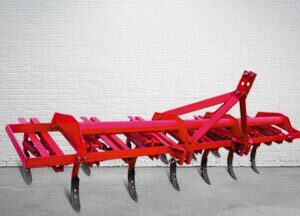 The tiller is available in 4 widths: 9, 11, 13 and 15 tines. The tiller is fully mounted on the tractor by means of Category I or II three point hitch pins. The spring-loaded tines swing back under break-away pressure of 163Kg: pass over the obstruction and return to the working position without affecting the working depth of the implement. A working depth upto 229 mm is possible in most soils and is simply controlled while sitting on the tractor seat.